This is part of the Melbourne Food and Wine Festival. 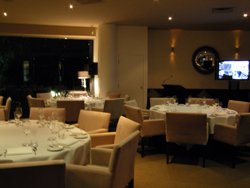 A premier event hosted at Fenix that brings the taste of Mugaritz to Melbourne. A once in a life time experience for all food lovers. Taste and witness the sparks of creativity at this truly intimate dinner. 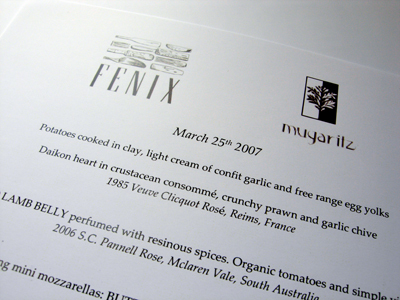 MasterClass presenter chef/owner Andoni Luis Aduriz of 2 Michelin Star Restaurant Mugaritz in San Sebastian, Spain has chosen Fenix Restaurant for his sole appearance in the kitchen whilst in Melbourne. Described as "one of the world's most influential and thought provoking chefs", Andoni and the kitchen team at Fenix will collaborate to create a unique seven course degustation extravaganza with matching wines. It would be an understatement to say that we have been looking forward to this since we first read about it and in honesty can say, that this exceeded anything we could have imagined. The event was limited to 36 participants - with 6 having a closer experience from the Chef's table. 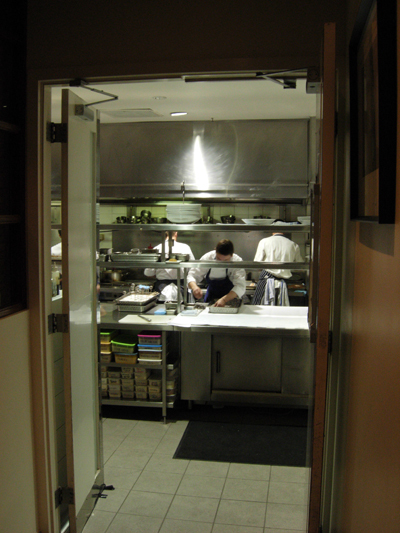 Those of us in the normal room would still get a rather intimate experience of the kitchen happenings via the live cam. I'm not really one to take photos of people but I couldn't resist this view of Andoni focused on the preparation of the clay potatoes. 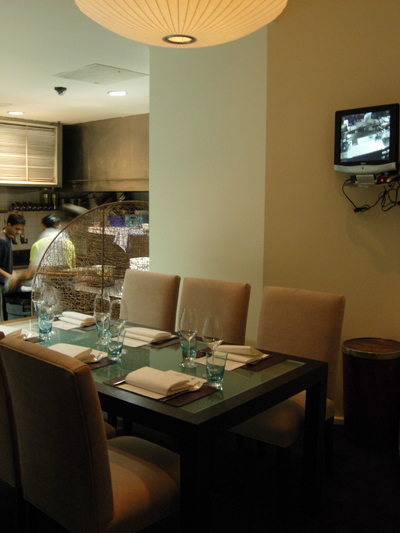 Accompanying Andoni to Australia were his head Chef Daniel Lasa and sommelier Jose Ramon Calvo. We were extremely fortunate to not only meet and talk with the most charming Jose but also to meet Andoni himself. We both came away with the impression of a most humble and down to earth person with a real passion for the food he is creating. Before the meal started a few words of introduction were spoken by Matt Preston followed by Raymond Capaldi who then introduced Andoni. He wanted us to imagine, experience and remember and it was most important for us to feel the emotion. For him, it was something that came from the heart. 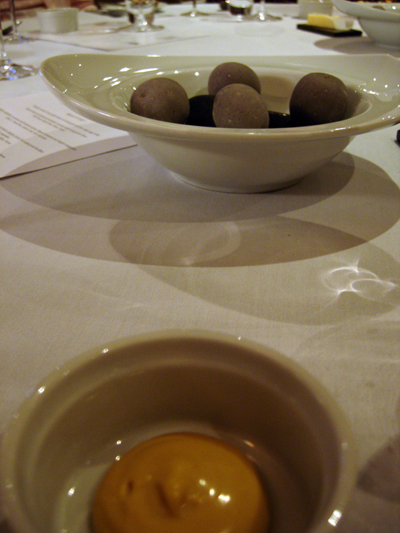 The potatoes were presented in a bowl with hot stones and we were reminded to make sure we picked a potato rather than a stone. I could see a bit of doubt in some of the eyes of our fellow diners as they contemplating peeling the potato. Luckily they were soon assured that all could be eaten. Having spied part of their preparation earlier I was immediately thrilled to know that I would soon be tasting them and indeed that satisfied any expectations. 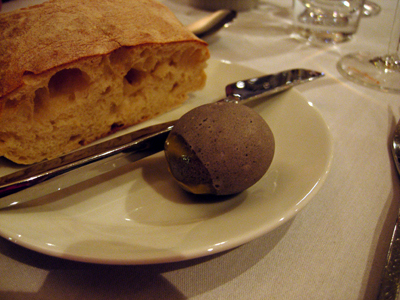 Jose had said it was important to smell and use our hands - the clay was fine like a shell offering a little crunch to the perfectly cooked potato - the creme of confit garlic was exceptionally moorish and seemed to also find it's way onto many a diner's bread. 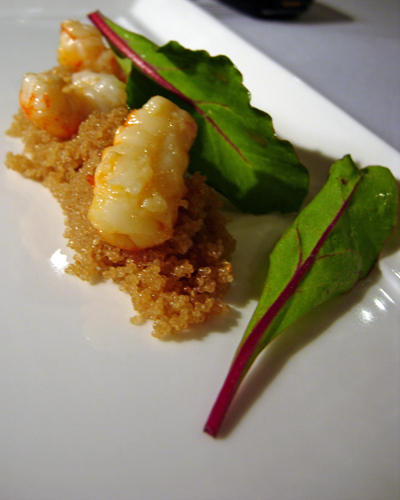 The daikon in this dish acts as a sponge to absorb all the flavours, the crunchy prawn providing a hit of flavour and a lovely textural change from the soft daikon. A different treatment of lamb belly when compared to Friday - here it was prosciutto-like, intensely coloured and crisp and offering salt and spice to the dish. Once again it provided another texture and flavour counter to the tomatoes, which for their own part, varied in taste and feel from one variety to another. 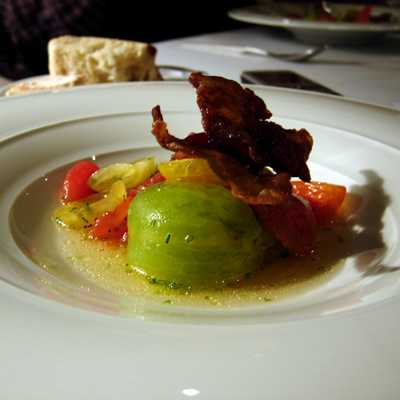 Representing mini mozzarellas: Buttery Cheese Gnocchi in salted pork bouillon, contrasting vegetables. I think the salted pork bouillon was made from Iberico pork bones - the gnocchi were cloud like and just melted in your mouth. Many satisfied murmurs accompanied this dish. It was fascinating to watch the kitchen plating this dish and the precision and organisation required. I've since found out how these are made and they require a thermomix - when I told Paalo this I could see that look in his eyes as he wondered how long it will be before he sees one sitting in the kitchen. 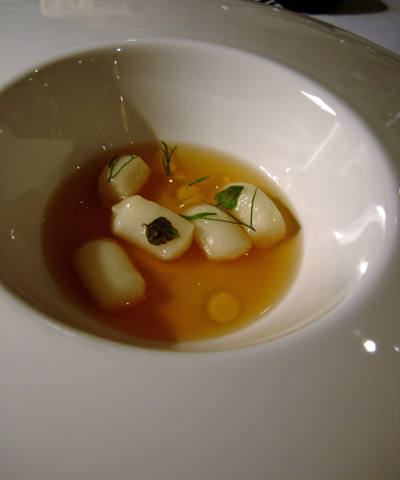 A pasta of amaranth, sardine broth and Yabbie tails, tender garden leaves. A most interesting dish - the leaves here were I thought integral to the enjoyment of this dish, they were the key to complete the offering. The leaf when filled with the amaranth and yabbie and eaten almost like a san choy bow proved to be the perfect combination - without the leaf, it felt like something was missing. It was interesting to observe the number of diners that rejected the beer, many "I don't drink beer" were heard, usually female but certainly not exclusively so. I have a feeling it wasn't allergy related but more of a class issue. It couldn't have been a taste issue as any resemblance to slab beer was in the name only. One of the points of the meal was to enjoy a unique experience not easily available, I feel that at least tasting the beer with this dish would have been part of that, to reject even that, after all you didn't have to drink it if you didn't like it, was a good example of the closed mind attitude of certain diners that evening. I couldn't figure out why they where there. To be seen perhaps? It's a pity because I believe the queue to get a seat stretched all the way to Catalan. Crushed Potatoes, broken eggs and vegetable coal, garlic "caesine" dressing. 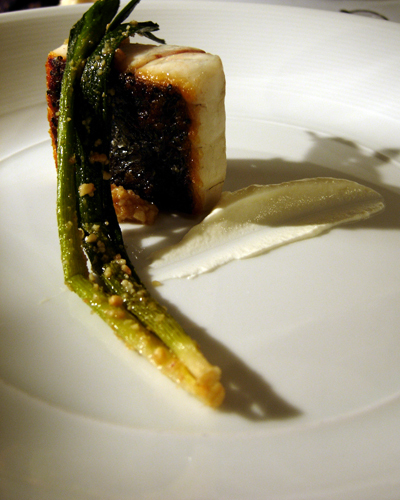 This is another dish that I'd really been looking forward to from the first time I read about it or saw it's picture. I must say that I was a bit thrown by some of the comments made before this dish even appeared on the table - some making pronouncements that they were not going to try it as they don't eat coal and that coal is a carcinogenic! Didn't they actually know what the dish was about or what the "coal" actually is? Where others dipped in cautiously, we dove straight in and it was love. 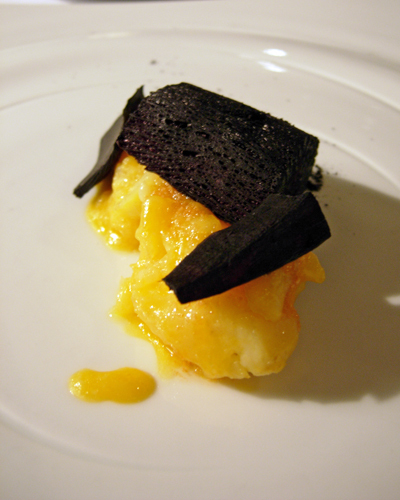 The egg yolk so wonderfully rich and luxurious as it wrapped around the crushed potatoes - the "coal" revealing it's true nature as you sliced through the larger portions. Crisp skin and wonderfully soft flesh a most elegant dish - I especially enjoyed the way the soured cream worked with the fish. 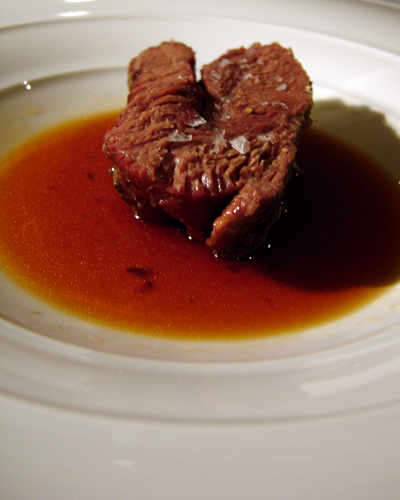 Beef stewed at 70 degrees for 40 hours, roasted vegetable tears, mixed crushed peppercorns. The vegetable tears is actually the broth served with this dish. It's made from roasted red peppers that are then sealed under plastic wrap to "sweat" and the juices that collect make the broth, thus they are the vegetable "tears". As Paalo said at the time when a fork and spoon was set - they must have absolute confidence that the meat is tender and indeed it was. Tender without any stringiness it was indeed sublime. This dish was served on an ice cold plate and as the blurb states it seeks a "contrast of temperatures, textures and cultures". 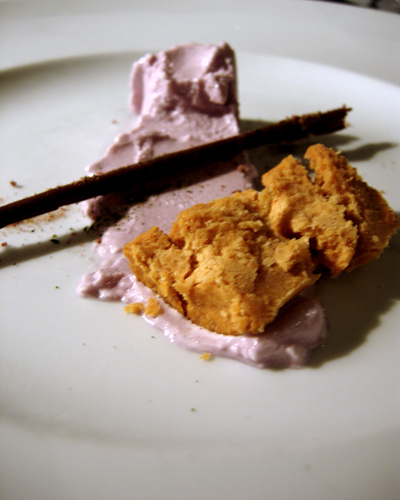 The violet ice-cream was just divine and had that silky smooth texture whereas the polvoron was hot with an almost sandy texture, mixing them together was a feast for the senses. Beautiful to look at and beautiful to eat. Our final dish of the evening - a half cylinder of chocolate cake, it's surface almost lacquered in appearance, the cake itself quasi mousse like. 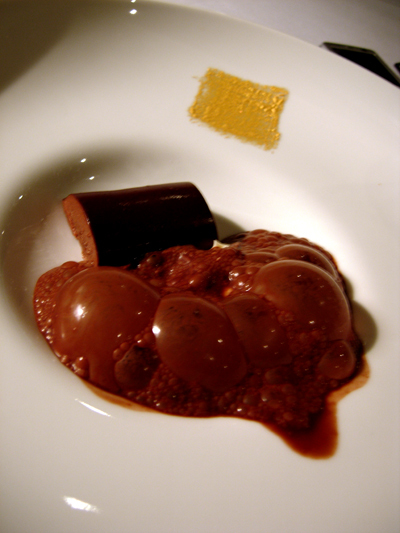 The almond cream sits just under the bubbles with a daub of gold on the rim of the plate. After service was completed - the whole kitchen crew came out into the dining room to a well deserved round of applause with Andoni speaking briefly again. A few presentations followed before the evening finally and reluctantly drew to a close. This will be a evening that will certainly be remembered and certainly met and exceeded any expectations we might have had. The passion, the intensity and the devotion is something that I will take with me. 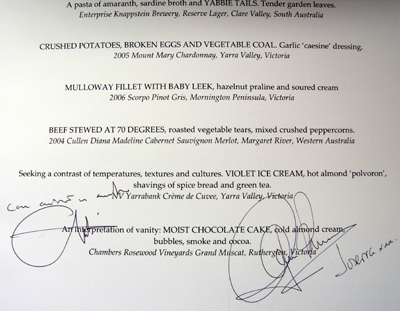 To cap off the evening and it's not something we would normally do, but Paalo managed to get our menu signed by both Andoni and Jose. 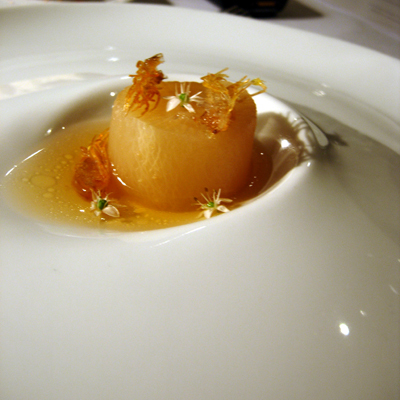 We both hope that we'll be able to experience this again at Mugaritz itself in the not too distant future.